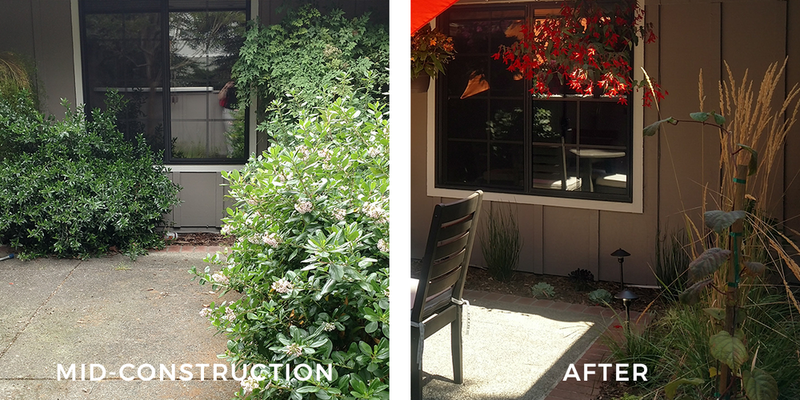 After the death of a large shade tree, this yard went from full shade to full sun. This leaves a blank slate for my clients to install their dream landscape. Our goal was to take this barren ground and transform it into a lush foliage driven landscape. We explored the depth of grasses and succulents, using the diverse colors and textures to create continuity and interest. The focal points are a harmony of medium green agave and sedums with lomandra softening the edges. Our contrast comes in with the light silver echevaria against the dark purple-green anemone. The results are stunning; the clients were thrilled by how their dreams came to life. We created an oasis that is also low water and low maintenance. They love entertaining, and the forms are stunning against the lights at night. A key feature is the repeating verticals created by the tall Calamagrostis and elegant pottery. The Dodonea hedges and Kiwi trellis extend the growing space vertically. An added benifit is privacy for a high traffic front patio. Using layers of planing open the space up. The hedges that were inherited with the house not only obscured the patio but blocked the bedroom window to the right. Our homeowners now enjoy watching the tall grasses catch the breeze and the extra light that's let in. Extending the landscape into the evening is a rare treat. 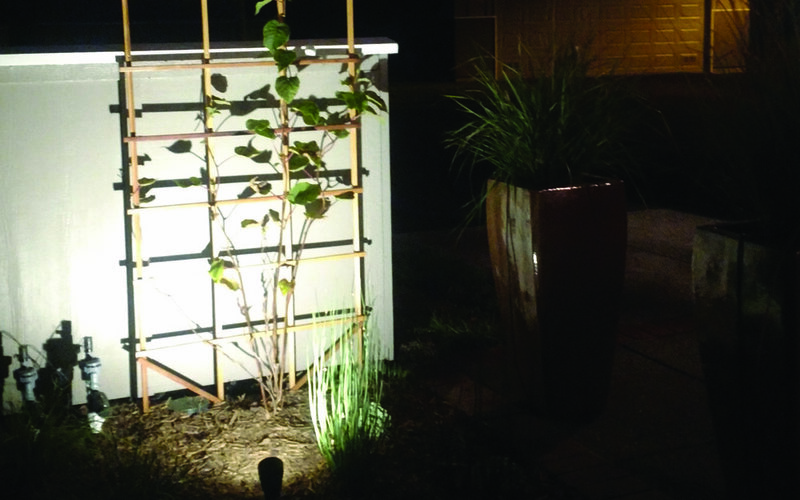 Uplights dramatically light up the kiwi vines and Chondropetalum. Softer path lights allow for outdoor enteraining and easy navigation after the sun goes down. On the extremes of the Shades of Green we have the Black Rose Aoenium and the silver Echevaria with the wispy Chondropetalum as a middle green. We choose an Arbor Mulch to keep moisture in the soil and discourage weeds.